The devil is on the run. For the first time since the 1970s, Detroit is on pace to record fewer than 90 fires during the notorious three-day Devil’s Night period. During the first 48 hours, 28 fires broke out, predominately in houses, compared to 66 last year. Most of the fires were suspicious. Devil’s Night ends tonight at midnight. 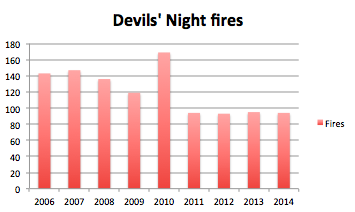 The number fires during Devil’s Night peaked at 810 during the three-day period in 1984 and has gradually declined until flattening out at an average of 94 over the past four years. It’s not clear what caused this year’s drop in fires, but Mayor Mike Duggan’s massive demolition efforts are likely a factor. Since he took office in January 2014, the city has demolished more than 7,000 houses and 150 commercial buildings. Traditionally, 60%-70% of Devil’s Night fires have occurred in vacant structures – a trend that continued this year. During the first 48 hours of this year, about 20 of the 28 fires were in houses, most of which were vacant. At least three fires spread to neighboring homes, and one person was injured Thursday. The decline of fires comes at an important time because the city is struggling with defective rigs, outdated equipment and malfunctioning hydrants. To prepare for Devil’s Night, the city put extra rigs on the street and fixed hundreds of hydrants. As many as 3,000 volunteers have patrolled the streets this year, according to Duggan’s office. The city also is ordering new fire engines and trucks. Follow our live blog as we provide up-to-date details and a map of all fires through Halloween morning. How ridiculous to suggest there are less fires because there are fewer vacant propeties. There’s still thousands of abandoned homes in Detroit. Perhaps there’s less arson because of more police presence and citizens patrolling their neighborhoods? Makes more sense. The demolitions are removing arson opportunities, and the police are making some criminals nervous lately. For the Love of GOD would you PLEASE Stop using that NEGATIVE name when you are talking about DETROIT !!!!!! THANK YOU !!!!! !